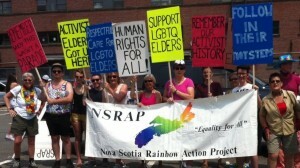 These were some of the signs that members of the Nova Scotia Rainbow Action Project (NSRAP) held during last year’s Halifax Pride Parade. They were a nod both to the first Pride marches as well as a desire to put the politics back into present-day Prides. Yes, Pride is about, well, being proud. Being proud of our sexuality, our gender identity, our love, our chosen families, and the community we have built. It is also about being proud of our many victories. Most recently in Nova Scotia we have won the inclusion transgender rights in the provincial human rights act as well as government-funded Gender Confirming Surgeries. In response to a petition, the province will no longer require people to have surgery to change the gender marker on their ID. NSRAP spent this past year fostering dialogue and strengthening bonds between LGBTQIA youth and elders. 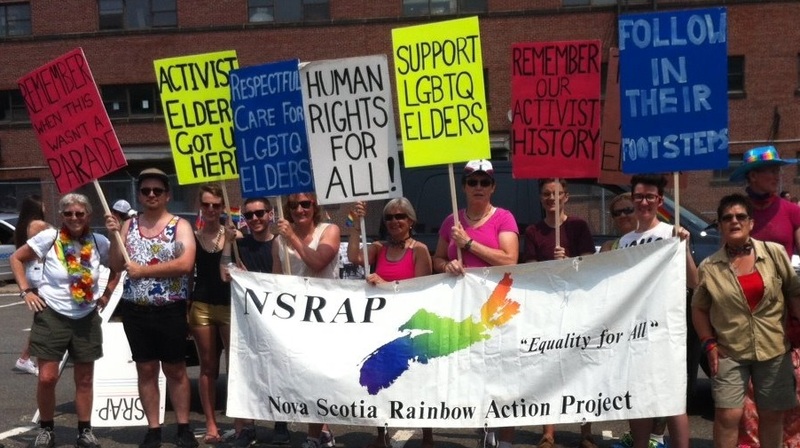 During Halifax Pride, NSRAP representatives will be there with you, celebrating the victories, both personal and political. But there is still much to do. Much to rally, to march, and to chant for. We know that there are still barriers to accessing Gender Confirming Surgeries (GCS) and that transgender Nova Scotians face discrimination in areas such as employment and housing. We know that Canadian Blood Services still won’t accept blood from people they consider men who have slept with men (MSM), unless you have been abstinent for five years. We are all too aware that members of our community still face violence, whether in Halifax or rural Nova Scotia. Many LGBTQIA elders, who fought for the rights we enjoy today, are not getting the support they need. In Halifax, we risk losing a historic queer building, the Khyber, which has the potential to serve as a future community space. Many queer and trans people of colour don’t feel represented by the mainstream movement, including within NSRAP, something we are committed to changing. This list is not exhaustive. For these reasons and more, NSRAP will be marching in Saturday’s Pride Parade. After Pride, after the confetti has settled, we’ll be back at it working to make things better for all LGBTQIA Nova Scotians. As a volunteer group and one with limited resources NSRAP does our best work when you, the community, get involved. To do so, find out more about your provincial LGBTQIA advocacy group, or to make a donation, please visit www.nsrap.ca. NSRAP is pleased to once again partner with Halifax Pride and the Halifax Public Libraries to present the TimeOUT lecture series.A forum for discussion and debate, the TimeOUT lectures present a chance to hear differing perspectives on issues affecting LGBTQIA* lives. The views presented in the TimeOUT Lectures are not necessarily those of NSRAP as an organization. Let’s march side by side in the Halifax Pride parade on Saturday, July 25th. This year NSRAP’s theme is “Celebrate What We’ve Achieved, Fight for What We Haven’t”. You’ll even get a beautiful pre-made placard stating what we’re fighting for! Fight for: racial justice, access to gender confirming surgery, homeless queer and trans youth, queer parents, trans women of colour, a living wage, housing and jobs for trans people, and to end hatred. Or make your own (the colour scheme is black and pink)! If you are interested, simply RSVP and show up. And don’t forget to invite your friends! We encourage you to wear sun protection and bring water as it can be hot day. The Parade begins at 1:00, starting at the DND dockyard (beside Barrington Street, under the MacDonald Bridge). Since we have minimal preparation required for our entry, we encourage you to arrive at noon. Enter through the intersection of Barrington and North Street to find the registration desk who can direct you to our spot in the procession. If you are driving, there will be parking spaces available at the north end of the dockyard.